This is very simple recipe of chutney or dip which is best going with dosa, poori, uttapam and idli also. This is my favorite chutney, when I go outside for having dosa on restaurant, they will serve two chutney with dosa i.e onion-tomato chutney and another is coconut chutney, I love both of them, so Today I tried this red chutney at home with my own style. This is very easy and tasty red chutney that very well goes with maida dosa or South-Indian snacks. This chutney is prepared with onion, tomato and other ingredients. I like the sweetness and tangy taste of chutney. I hope you'll all like it and tried it at your home. if you are looking for more chutney recipes then do check tamarind chutney, coconut-tomato chutney, tomato-onion chutney, and coriander chutney. 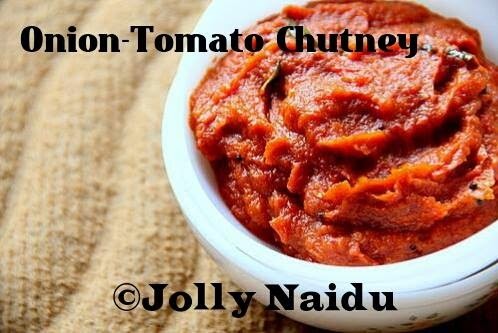 Learn here the recipe of How to make Onion-Tomato / Red Chutney with following steps. 1. Cut onions and tomato into small pieces. 2. Grind together the chopped onion and tomato along with red chilli powder and salt without water. 3. Heat oil in a pan, add mustard seeds and wait till to splutter. 4. Add curry leaves and onion-tomato mixture, add a 1 tbsp of water and bring it to a boil. 5. Boil, till it becomes thick. Your onion-tomato chutney is ready to serve with idli, uttapam or dosa.